Christmas is definitely coming – and it is coming very quickly! Families have different ways of preparing for, or actually counting down to Christmas Eve. We officially have FOUR different Advent calendars in our home – four different routines each night to help our family countdown to Christmas. 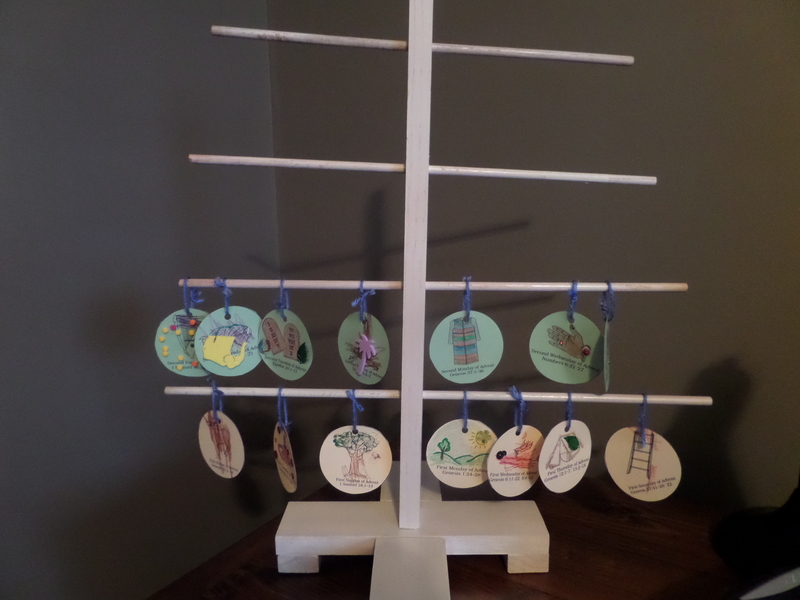 The first is a Jesse Tree. We made this together as part of an Advent program at church a few years ago, when our son was young and before our daughter was born. I like this routine because it tells the lineage of Jesus and each night we get to hear stories about many different people from the Bible. 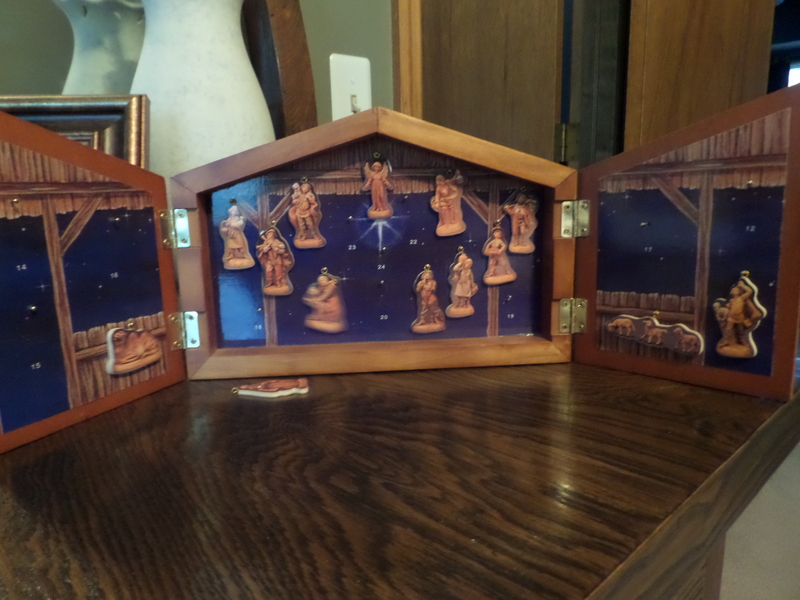 The second is a little advent nativity scene where you add a little wooden figure to the nativity each day. I’ve had this since I was young, and by now I can’t even remember where it came from! But it is special to me because I remember using it when I was younger. We also have a paper chain that my son made in school – we tear a link off each day. 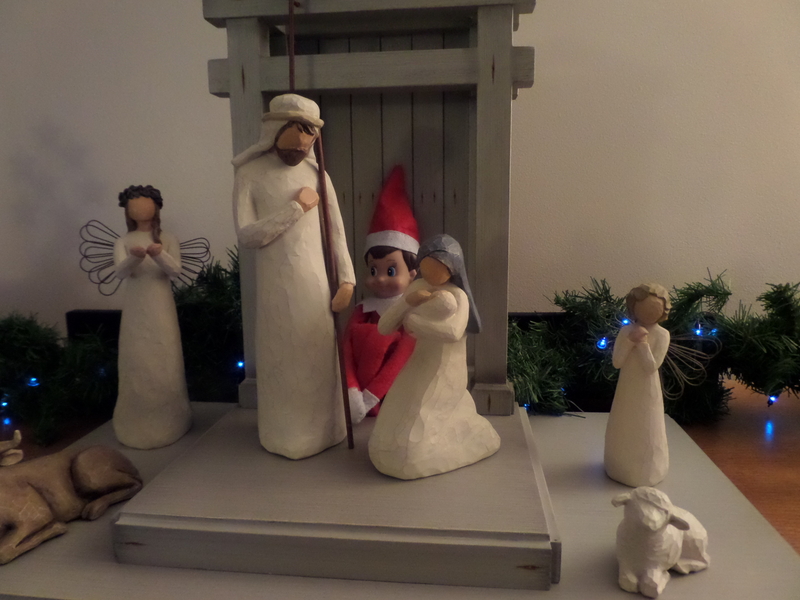 And finally, in the basement near the Christmas tree, is a Little People nativity. 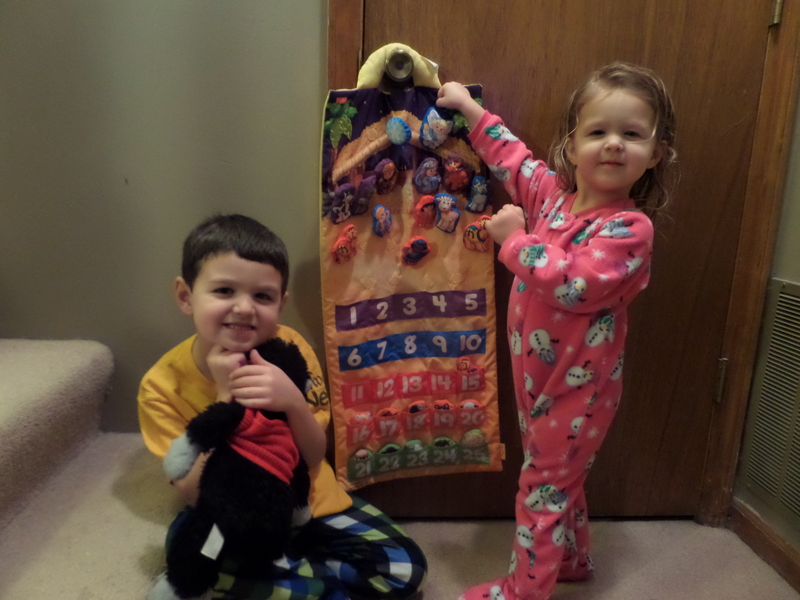 It has fabric images of people and animals from the nativity scene with velcro on the back to place at the stable each day, and a little button at the top that plays “Silent Night.” The kids take turns each night placing a figure in the nativity. These are all wonderful ways for our family to come together each night and focus on Christmas as the celebration of Jesus’ human arrival on earth, and to spend time together in reflection and prayer. But the other night, as we start our nightly “countdown to Christmas” parade around the house, my focus is on the long to do list I have after the kids are in bed. Then I hear the kids arguing about who’s turn it is to put up the next day on each countdown. They fight about the Little People nativity the most. They both want to push that little button to play ‘Silent Night.’ My son gets mad when my daughter doesn’t place the people or animals correctly. She’ll put a camel on the roof of the stable, and my son will have this look of disbelief and exasperation. Every other day I have to remind him that it is OK – calm down! You can fix it when she leaves! With my lack of focus and the sounds of children arguing, I wonder if we are missing the point. I think the problem is that this “parade” has become just another part of our bedtime routine. Routine isn’t necessarily a bad thing. If you turn faith practices into routine it is easier to make God a part of your daily life; part of a daily, hourly, constant focus on and conversation with God. Of course – this faith practice will only work if I pay attention to where my focus is, and try to keep those kids from arguing! The routine is good and necessary. But it becomes more difficult to experience a “wow” moment through these routines; a mountaintop experience, a faith “high” – whatever you want to call that moment when you sense the presence of the Spirit in a big way. God is most definitely present! So my effort each night as we walk towards Christmas is to allow that presence to shine through our words – pause a bit to let the words soak in, take an extra 5 minutes to talk with the kids. Do they understand what I just read? Do they know why it is important that we just placed a camel figure at the nativity (whether it be on the roof or elsewhere)? God is present in these moments, and God reveals his presence – sometimes in that big “mountaintop” way – if I’m paying attention!! And of course, on top of all of this parading around the house each night, the kids parade around the house each morning searching for that darn Elf on a Shelf. This is all in good fun – but even our little Alfie tries to keep the focus on Jesus as we draw closer to Christmas Eve! Categories: Family, God at Work | Tags: Advent, Christmas, faith, faith practice, family, Jesus, love, parenting, routine | Permalink.